Zion's slot canyons, hidden trails, fossilized dunes, domes, valleys, statues of sandstone, creeks and fun rock rimmed swimming holes fill the east side of the park. Most of Zion's names were given before the tunnel was built, and pioneers who named most of the peaks in the canyon could not get to the east side, thus little is named there. The vertically and horizontally striated, Checkerboard Mesa is one of the few exceptions and it was named by one of Zion's former Superintend ants. The crossbedding evident on this mesa can be seen in other areas of the park, such as Hidden Gardens and the East Rim Trail. An difficult and unmarked route leads up near the top of Checkerboard Mesa and another runs behind the mesa to a view of Checkerboard Arch - both trips offer magnificent views. 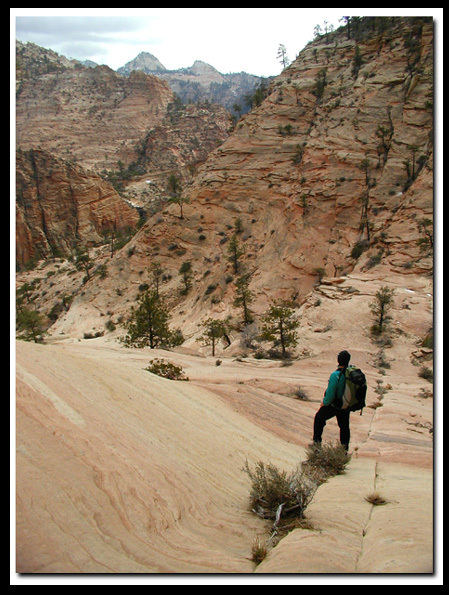 Little known hikes and backpacks, as well as famous trails dot the landscape on the east side of Zion's landscape. Gems on the east side of the park include: Many Pools, Two Pines Arch, Jug Handle Arch, Shelf Canyon, Checkerboard Arch, Hidden Gardens, Hidden Arch, Progeny Peak, Two Pines Arch, Clear Creek, Gifford Canyon, Spry Canyon, East Temple, Mountain of the Sun, Cockeye Falls, Orderville Canyon and perhaps the most magnificent hike in the National Park system, the Zion Narrows. The Zion Narrows begins on the east side of the park, up North Fork Road and meanders downhill for 16-miles through a magnificent slot canyon to where hikers exit at the Temple of Sinawava in Zion Canyon. Also on the east side of the park is Parunuweap Canyon, which is similar to the Zion Narrows, but the hike is in a remote and wild section of Zion before wandering off into BLM land. Don't expect to see many if any hikers in the wilds of Parunuweap however. Many Pools is an enjoyable hike in the spring and fall and after it has rained in the summer. The pools spill over with water after rain and add to the charm to the slickrock adventure. Two Pines Arch, Hidden Arch, Checkerboard Arch and Jug Handle Arch routes are fun adventures to some of Zion's rare freestanding arches. Hidden Gardens and Shelf Canyon are wonderful slot canyons that almost anyone can enjoy. When hiking the East Rim Trail make sure to stop and notice Echo Canyon. A beautiful slot section can be seen from this long day hike or overnight backpack. Zion National Park Mileage to Salt Lake City and Las Vegas. Clear Creek - Although the skies of the Southwest are usually blue and free of rain clouds, the occasional thunderstorms bring magnificent waterfalls to the east side of Zion National Park. Although Clear Creek is usually dry, it can rain so hard in the park that the rain is only slightly absorbed, leaving the rest to run off the sandstone and into Clear Creek and other drainage areas. Pine Creek Waterfall - The trailhead is between the south side of the Zion-Mt. Carmel Tunnel and Canyon Junction. From Canyon Junction drive a half-mile and park on the bridge. This is not a marked trailhead but you will see the well treaded path down the hill. Follow the creek upstream to a charming waterfall. Private vehicles can travel SR-9, from Zion's south entrance, out the east entrance (or visa versa) to the junction of SR-9 & US-89 year-round, 24 hours a day. See tunnel restrictions for Oversized Vehicles. 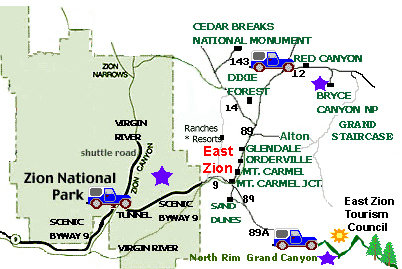 Summer, Spring and Fall, the only access to the Scenic Zion Canyon Drive is via Zion's shuttle. During the winter private vehicles can travel in the canyon. Exact dates the shuttle runs may vary. Long ago, ancient storms roared, carving and molding the rock on the east side of Zion. This slickrock is often referred to as petrified sand dunes, forming structures that look like dunes of sand frozen in time. Checkerboard Mesa is host to some of the most unusual patterns anywhere. The unique crossbedding is a web of vertical grooves that were formed by the freeze and thaw cycle. The horizontal layers were layers of sand that were laid down by wind millions of years ago.